© 2002, © 2019 by Paul Freeman. Revised 3/3/19. A 12/19/40 aerial view of Reynolds Field (courtesy of Patrick Raftery of the Westchester County Historical Society, via Ron Yaskovic). 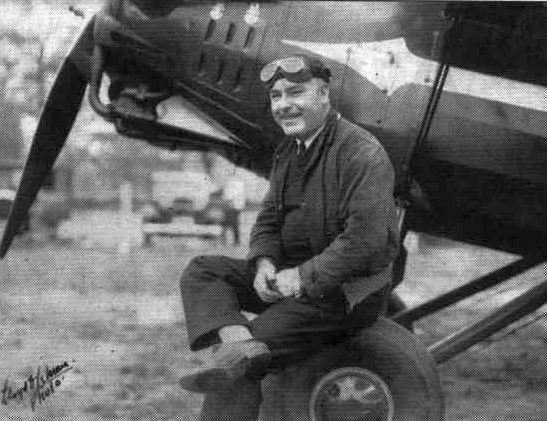 In 1937 Frank Reynolds opened some of the flat fields on his dairy farm as an airfield for small private planes, Reynolds Field. (courtesy of Patrick Raftery of the Westchester County Historical Society, via Ron Yaskovic). and 3 light single-engine planes visible parked near some small buildings on the south side. which depicted Reynolds Fieldas an auxiliary airfield. A 4/3/47 aerial view of Reynolds Field (courtesy of Patrick Raftery of the Westchester County Historical Society, via Ron Yaskovic). 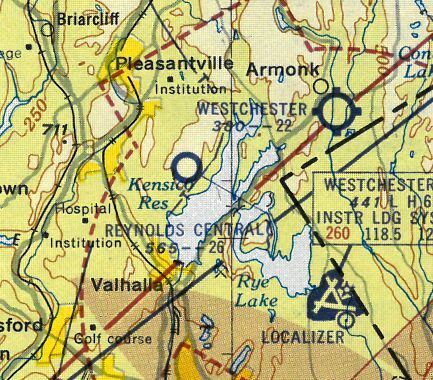 Reynolds Field was evidently renamed at some point, as the 1947 USGS topo map depicted this airport as “Westchester Airport”. 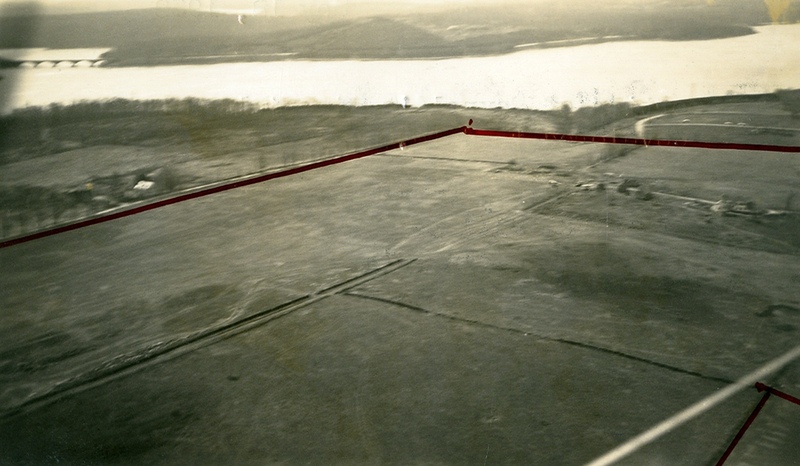 An undated aerial view looking southeast at Reynolds Field (courtesy of Patrick Raftery of the Westchester County Historical Society, via Ron Yaskovic). 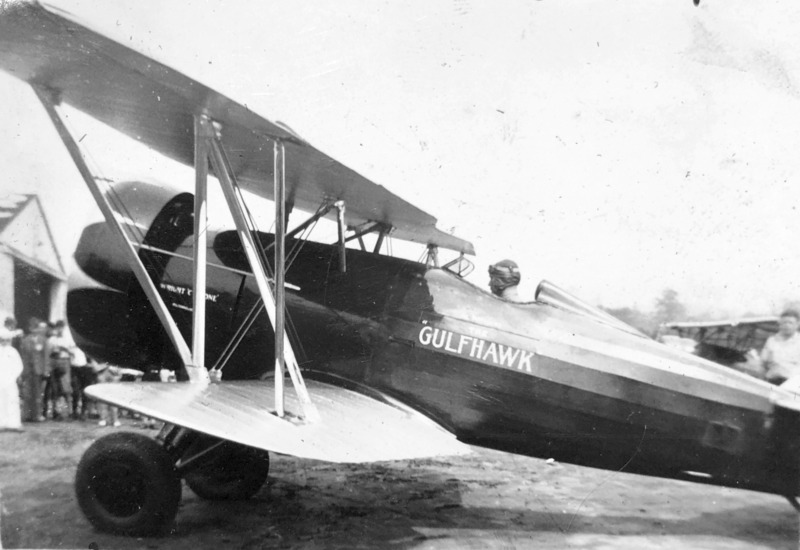 An undated photo of a taildragger (model unidentified) at Reynolds Field (courtesy of Patrick Raftery of the Westchester County Historical Society, via Ron Yaskovic). depicted “Reynolds Central” Airport an having a 2,600' unpaved ruwway. 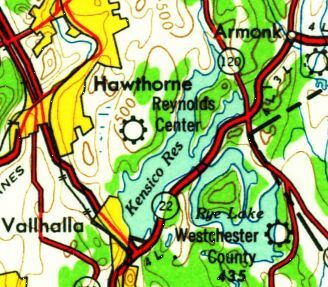 The 1961 USGS topo map labeled the airport with yet another variation of its name: “Reynolds Center” Airport. as it was no longer depicted on the 1961 NY Terminal Aeronautical Chart (courtesy of Tim Zukas). and the southern & eastern property outlines are still recognizable. The site of Reynolds Field is located northwest of the intersection of East Stevens Road & Westlake Drive. Thanks to Ron Yaskovic for pointing out this airfield. 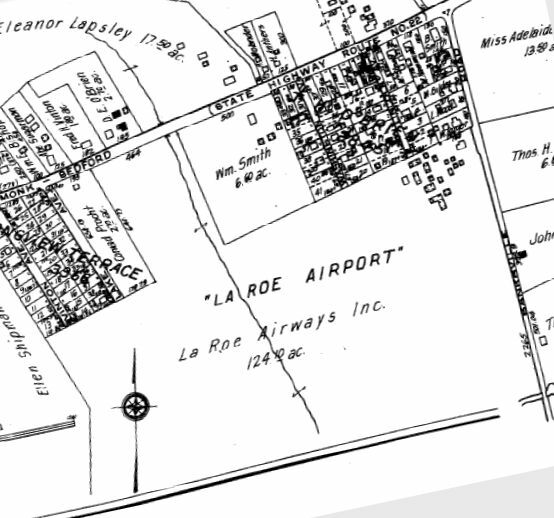 “La Roe Airport”, as depicted on a circa 1930 Westchester County map (courtesy of Thomas Genett). as it was not yet listed among active airfields in the 1925 Commerce Department Aeronautical Bulletins (courtesy of Jonathan Westerling). La Roe Airport was started was Dr. K. La Roe & later operated by Webster Schmaling, according to a 1935 NY Times Article. according to “Westchester: A Portrait of a County” by Alex Shoumatoff. which depicted “La Roe Airport”, owned by Le Roe Airways Inc, and comprising 124 acres. 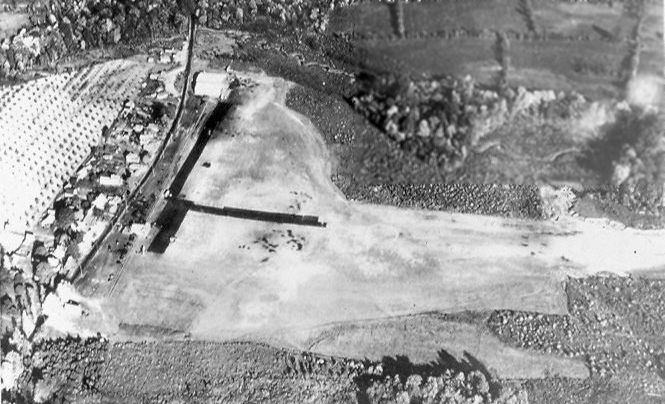 The airport was depicted as being irregularly-shaped, with a complex of many small buildings on the northeast corner. owned by Le Roe Airways Inc, and comprising 124 acres. Thomas Genett reported, “I [have] a receipt for my father's first airplane ride. 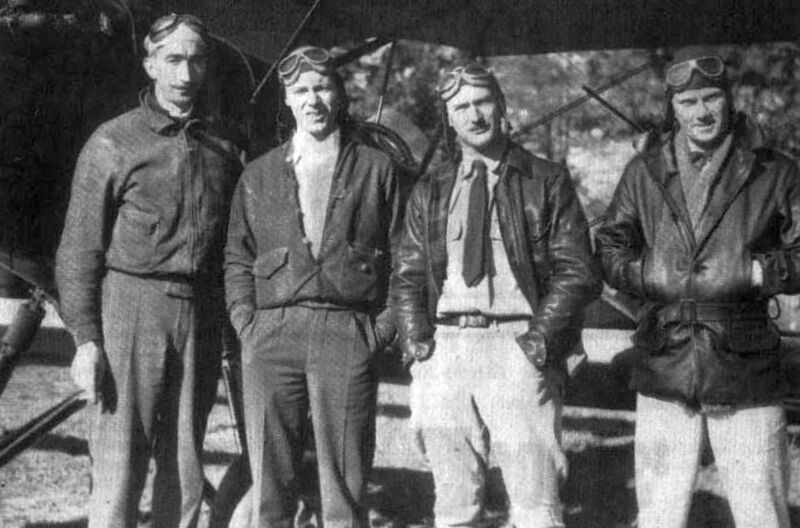 A circa 1930s photo of an unidentified group of pilots in front of a biplane at La Roe Airport (courtesy of Ian Baren). A circa 1930s photo of pilot James McClean sitting on a plane at La Roe Airport (courtesy of Ian Baren). according to a written history by Robert Kelly. 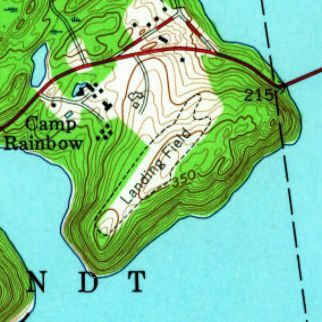 The 1955 USGS topo map depicted the site of La Roe Airport as “Memorial Field”. 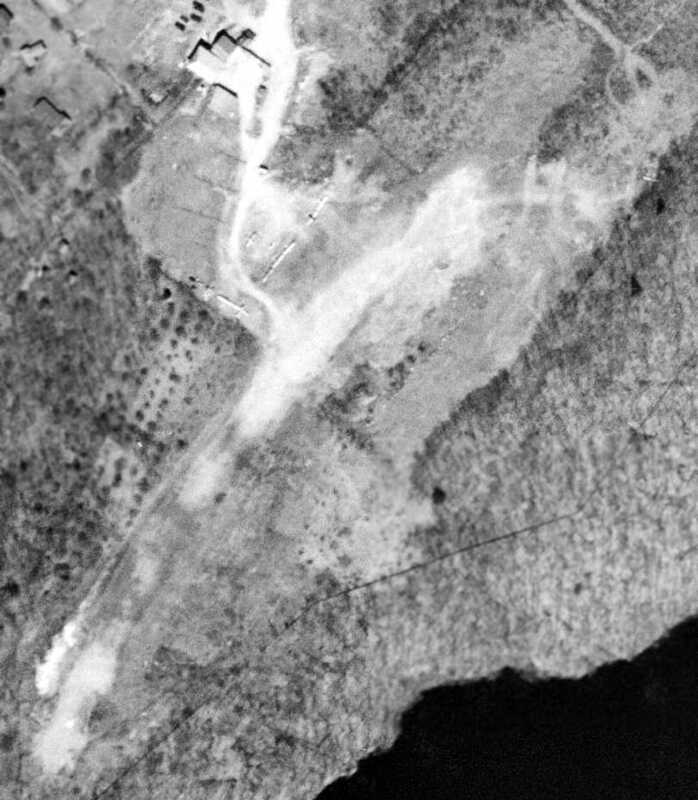 A 2014 aerial view showed no trace remaining of La Roe Airport. 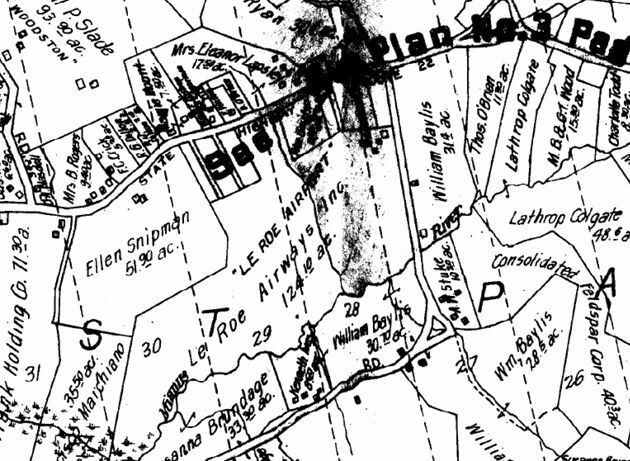 As of 2015, street maps labeled the site of La Roe Airport as Bedford Village Memorial Park. 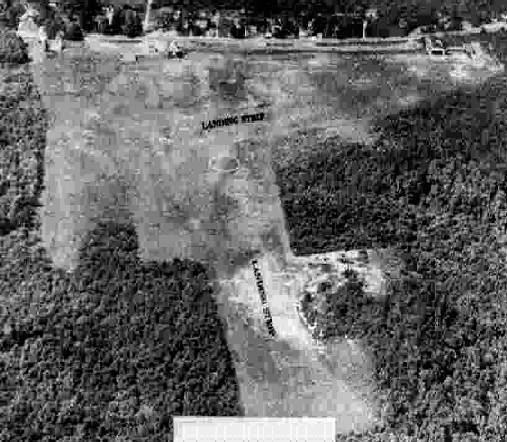 The site of La Roe Airport is located at the southern terminus of Jefferson Lane. Thanks to Thomas Genett for pointing out this airfield. 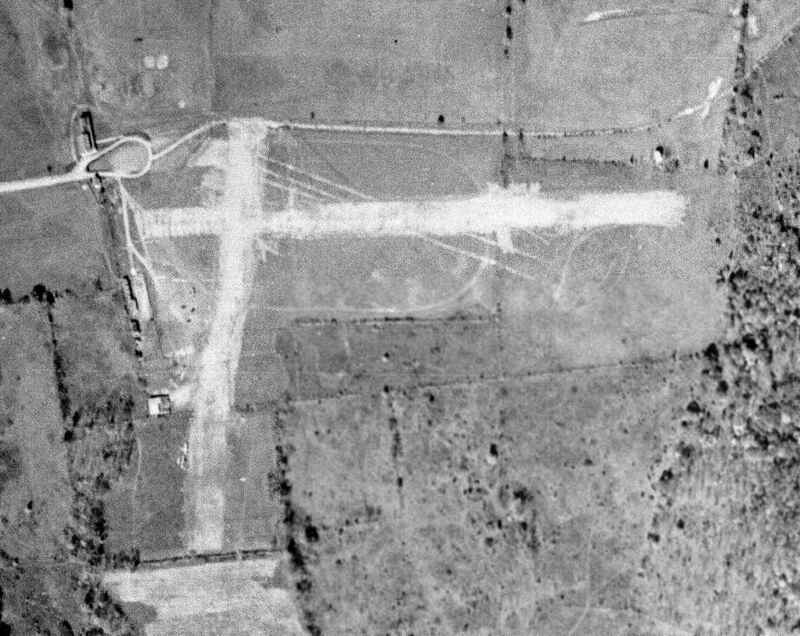 A 10/20/41 USGS aerial view of Stewart Airways Airport. which depicted it as having 2 unpaved runways, with a few small buildings & 2 light single-engine aircraft on the west side. Stewart Airways Airport was not depicted on the 1944 USGS topo map or on the 1945 AAF Airfield Directory (courtesy of Scott Murdock). like many other small general aviation airports near the coasts during the war. 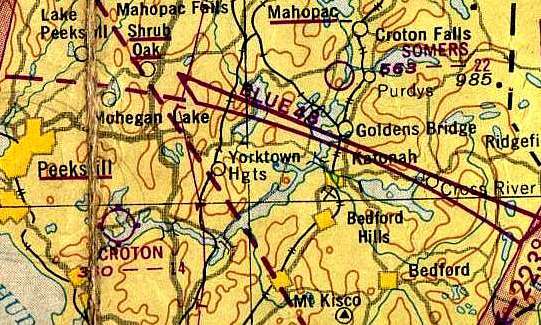 as the January 1945 NY Sectional Chart (courtesy of Ron Plante) depicted Somers Airport as an auxiliary airfield. 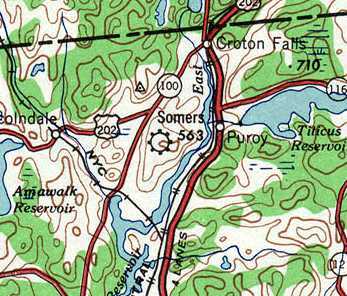 The earliest topo map depiction which has been located of Somers Airport was on the 1946 USGS topo map. Victor Sedrick recalled of Somers Airport, “My father Arthur Sedrick gave me my first airplane ride there when I was about 1 or 2 years old in 1946 or 1947. He managed this airport for a time in the late 1940s. There were no lights or radio at the field in the beginning necessitating autos lined up along the runway for late arriving aviators. Robert Booth recalled, “In the Summer of 1949 I took some flying lessons, my first, at an airport in Somers, NY. At about the same time there was also a 9-hole golf course on the site, just south of the famous 'Elephant Hotel' on Route 22. 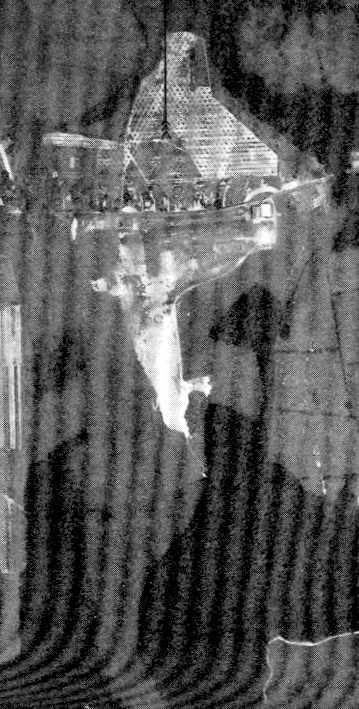 This was a very makeshift operation, with just one J-3 Cub & the operator of the airport. It might not have been an actual airport, just a pasture with an airplane. I was a teenager without money & he had a program of numerous short flights for people in my situation. 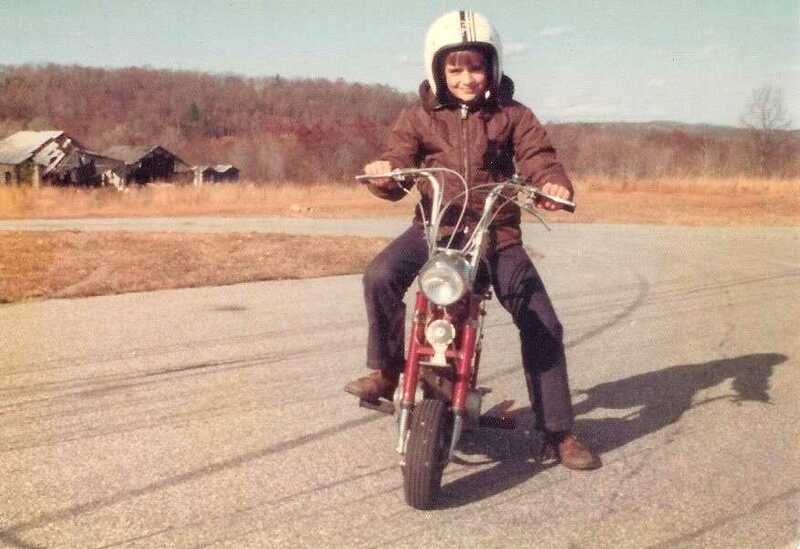 I didn’t get any ground school & there was no curriculum. In a few weeks I made 7 dual flights of 10-25 minutes; I had 2:00 total. 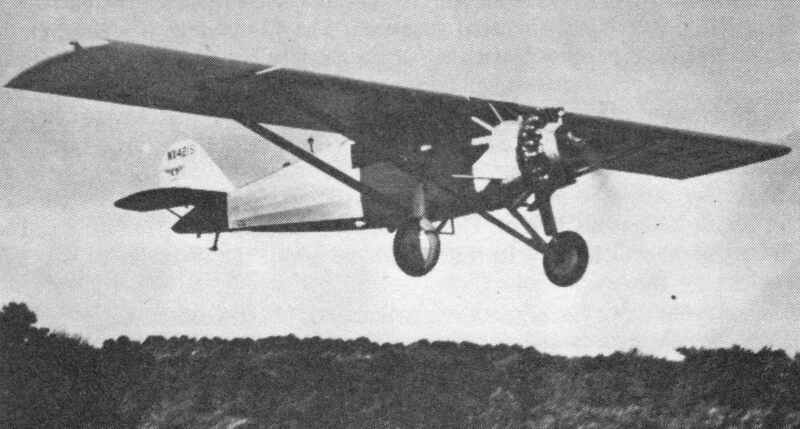 Joe Rao recalled, “I got my most memorable first ride in an airplane at Somers... two half-hour dual hops. 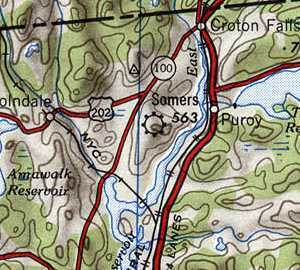 Somers was just a sod field at the top of rolling flat-topped hill about 100' above Route 100. It was open from about 1941 to about 1947.
don't know how it managed to land there at that small field. 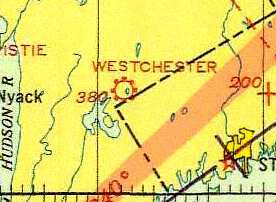 The earliest aeronautical chart depiction which has been located of the Somers Airport was on the 1950 NY Sectional Chart (courtesy of Mike Keefe). 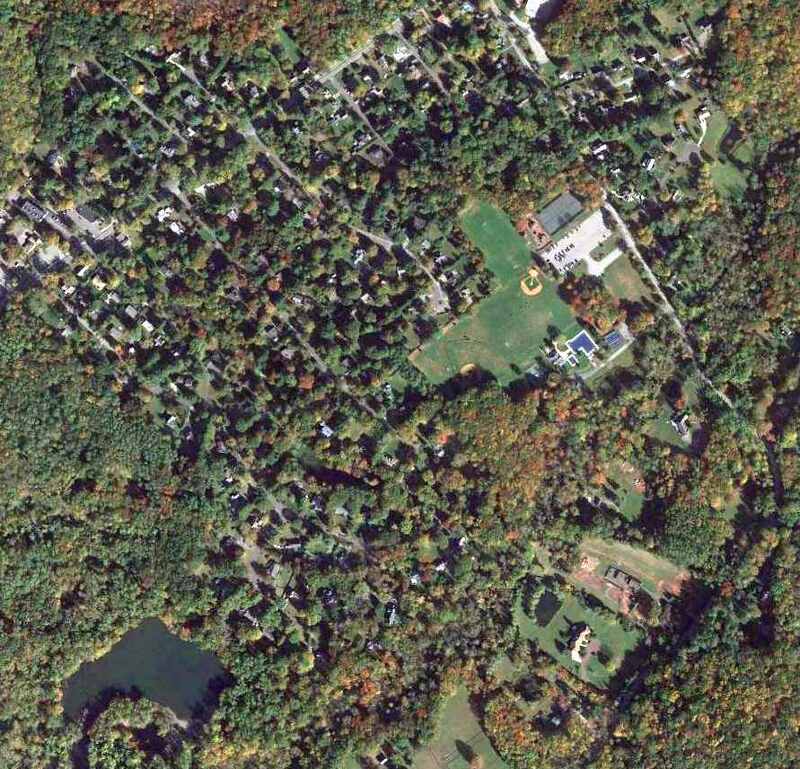 It depicted Somers as having a 2,200' unpaved runway. 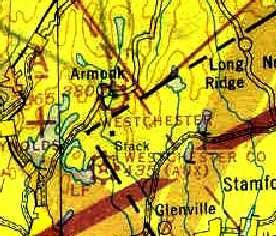 The last depiction which has been located of the Somers Airport was on the 1956 USGS topo map. 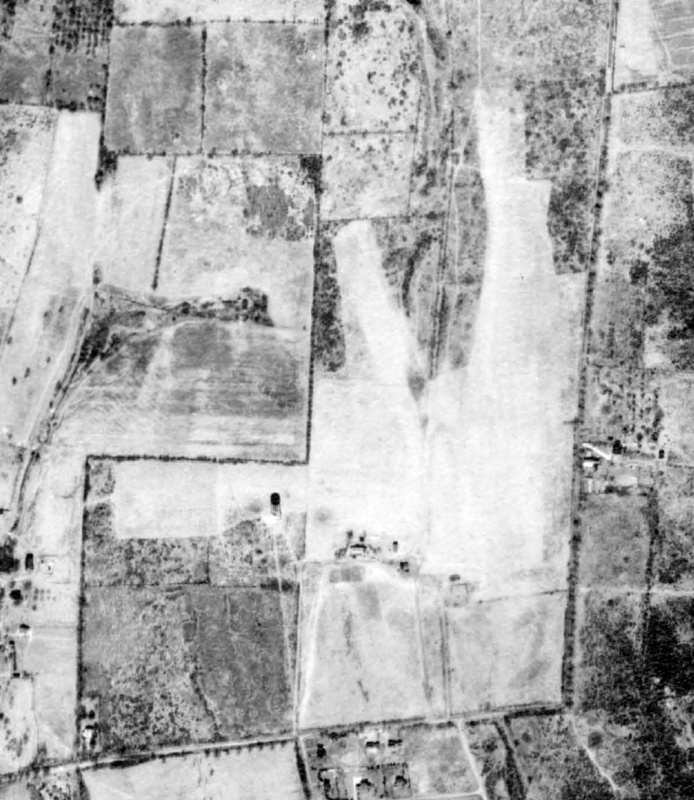 The earliest photo which has been located of the Somers Airport was a 1958 aerial view. It depicted an open irregularly-shaped grass field with a few small buildings on the west side. 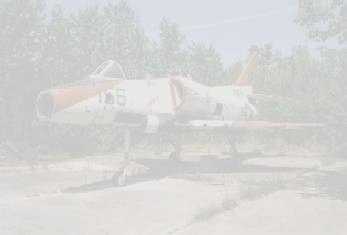 There were no aircraft visible on the field, or any other indication of recent aviation usage. as it was no longer depicted on the 1960 USGS topo map. 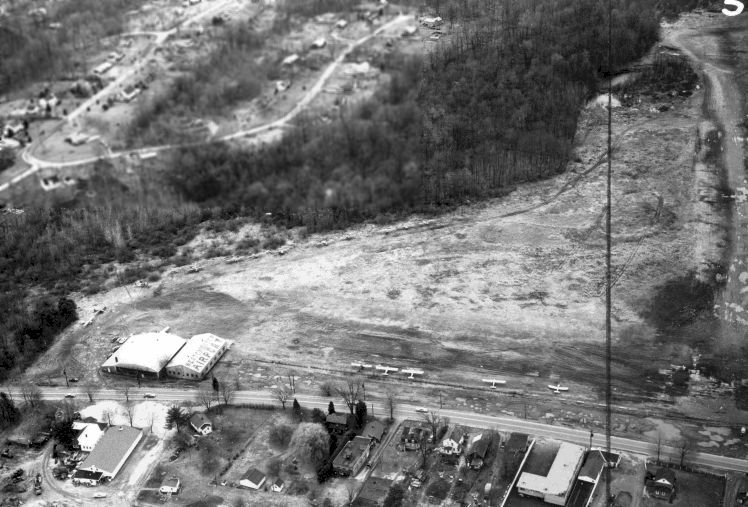 A 1974 aerial photo depicted the site of Somers Airport in much the same manner as the 1958 photo. a $55 million complex which enabled the centralization of 3,000 employees located in other facilities in the surrounding area. as IBM maintains the private Somers Heliport (NY44). 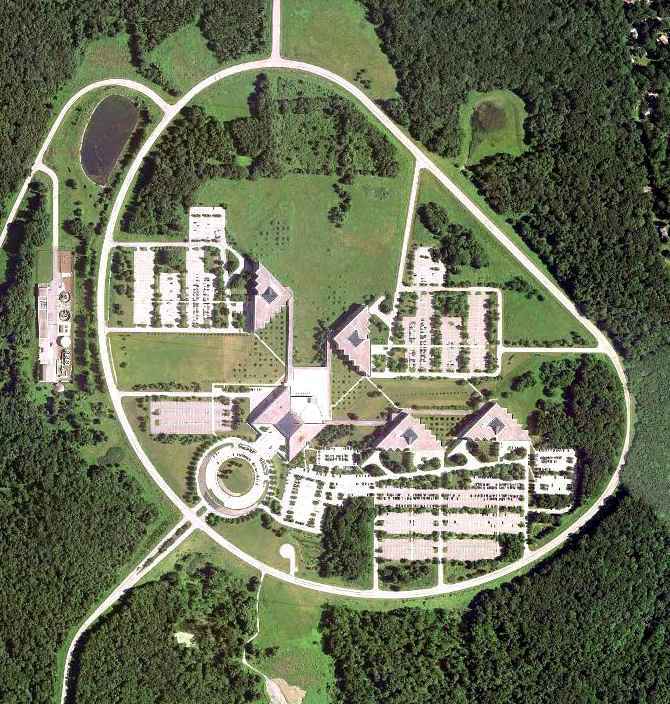 A 1993 USGS aerial photo depicted the IBM office complex, without any trace remaining of the former airport. 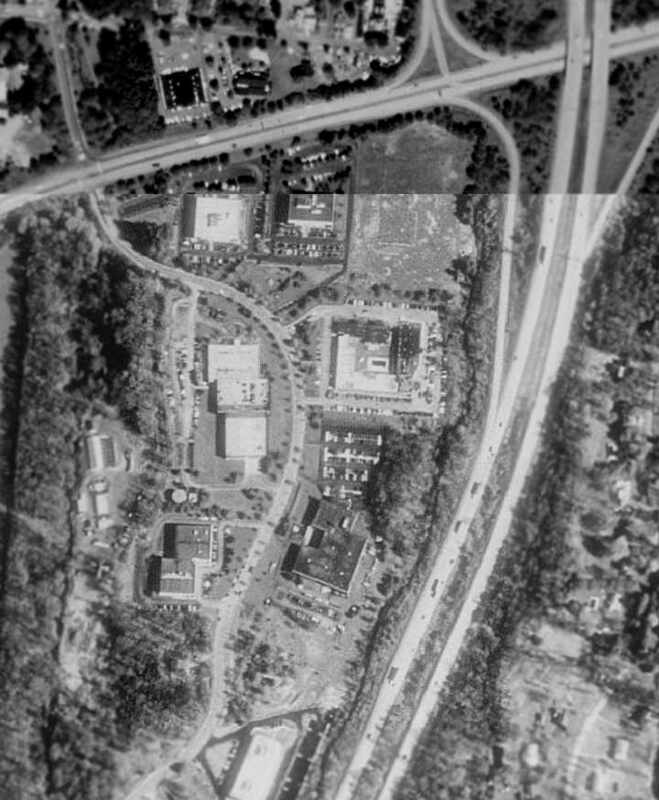 A 6/18/10 aerial photo depicted the IBM office complex, without any trace remaining of the former airport. 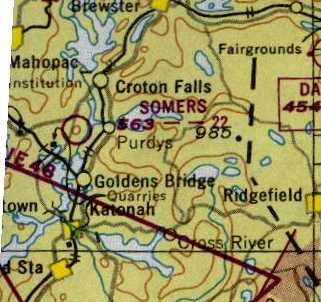 The site of Somers Airport is located northeast of the intersection of Route 100 & Goldens Bridge Road. 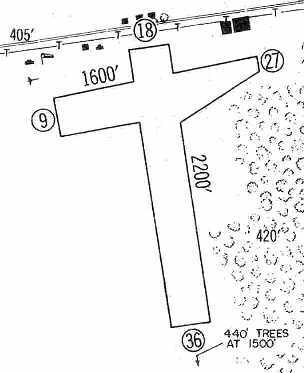 Croton Airpark, as depicted on the July 1950 NY Sectional Chart (courtesy of Jim Stanton). 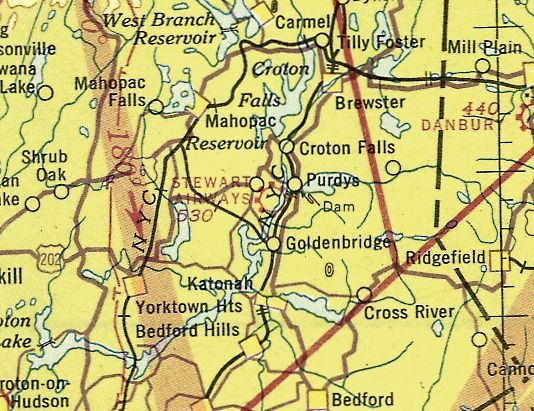 as it was not yet depicted on the 1945 NY Sectional Chart. was on the July 1950 NY Sectional Chart (courtesy of Jim Stanton). It depicted Croton as having a 1,400' unpaved runway. 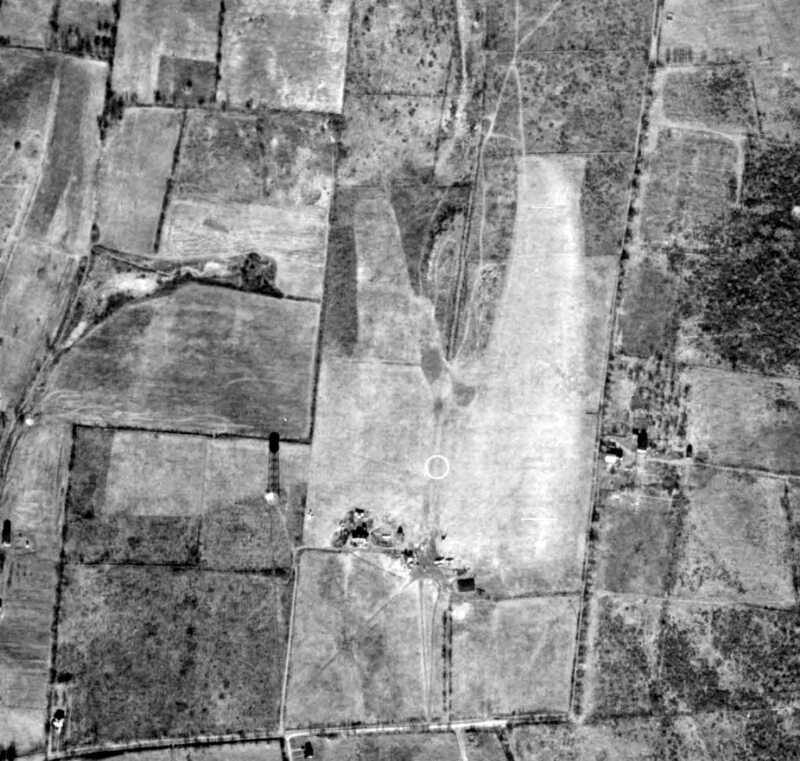 The earliest photo which has been located of Croton Airpark was a 4/15/53 USGS aerial photo. with 6 single-engine aircraft parked near some small buildings on the northwest side. 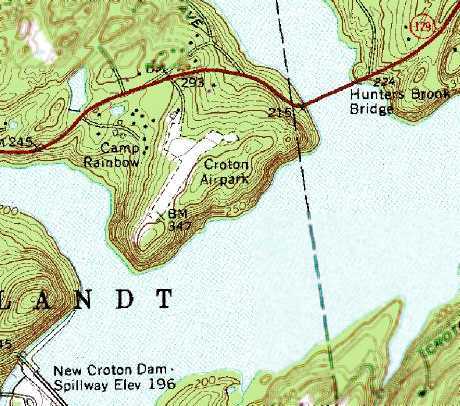 The 1955 USGS topo map depicted Croton as a single unpaved northeast/southwest runway, labeled simply as “Landing Field”. A 3/3/64 USGS aerial photo depicted 8 single-engine aircraft at Croton Airpark. 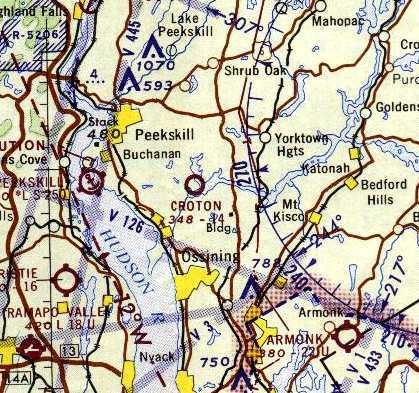 The last aeronautical chart depiction which has been located of the Croton Airpark was on the 1965 NY Sectional Chart. 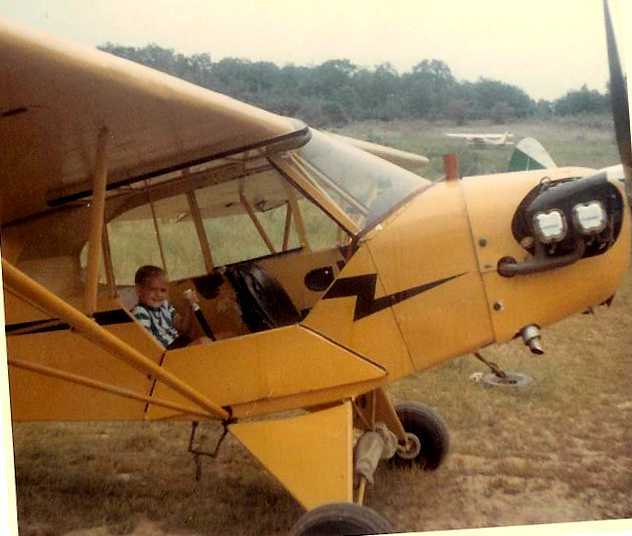 A September 1968 photo of John Steiner “flying” a J3 Cub at Croton Airpark. John Steiner recalled, “In the late 1960s my father used to fly a Piper Cub from a small field near the reservoir in Croton. I have fond memories of him taking me flying. I remember being there once when I was very small & it must have still been open (late 1960s) and there had been a crash. Berl Brechner reported, “Croton Airfield... was an active airport until mid-1970s or so. with several nearly fallen-down hangars in the background. John recalled, “It had a single paved runway. There used to be folks who flew model airplanes on the weekends. with a few small buildings on the north side. But there were no aircraft visible or any other signs of recent usage. (although that does not prove it was still open at that point). It depicted the field as having a single unpaved northeast/southwest runway. with the runway having been replaced with a residential street, Longview Road. 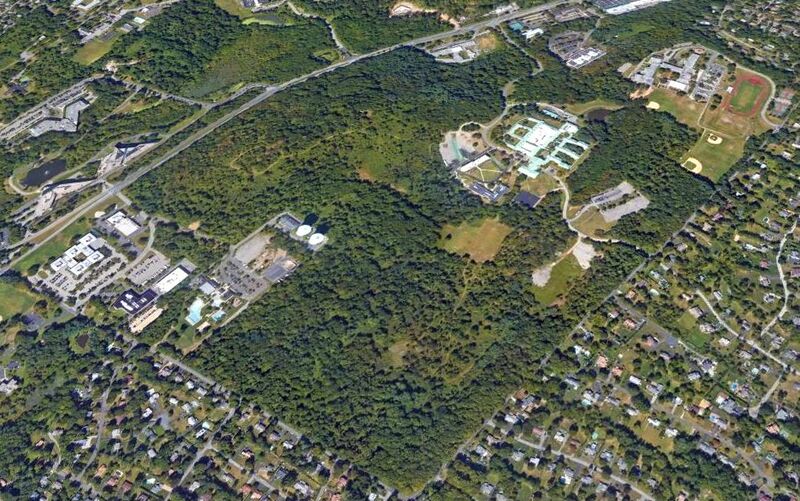 A 2014 aerial photo showed no remaining trace of the former Croton Airpark. An August 1928 photo of Charles Lindbergh landing at Armonk Airport (courtesy of the North Castle Historical Society, via Kenneth Hudson). This airport was adjacent to the southeast side of the town of Armonk. Charles Lindbergh flew into the Armonk airport in August of 1928 & greeted hundreds of well-wishers there who found out about his arrival. It was also reported to have been visited by Amelia Earhart. An August 1928 photo of Charles Lindbergh's plane & 8 biplanes in front of the Barrett Field hangar (courtesy of the North Castle Historical Society, via Kenneth Hudson). 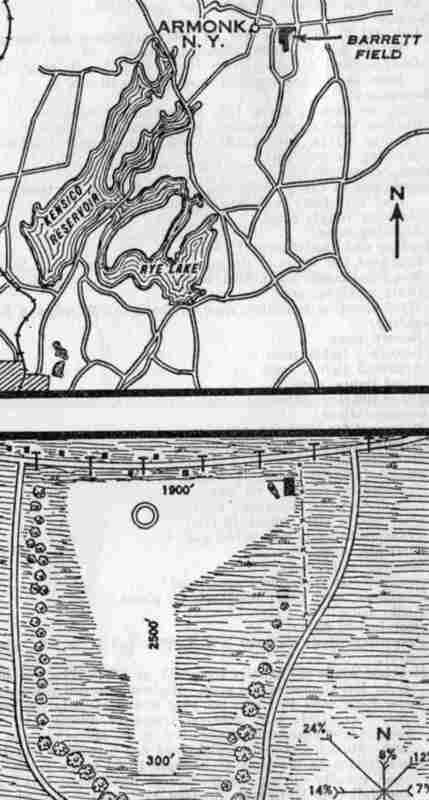 The location & layout of Barrett Field, as depicted on a 1929 NY Legislative Report (courtesy of Tom Heitzman). the longest measuring 2,500' north/south. The field was said to be leased from D.J. Barrett, and operated by Barrett Airways Inc.
described Barrett Field as being operated by Barrett Airways, Inc., and being 2,500' x 1,900' in size. as that is how it was labeled on the 1930 Rand-McNally "Standard Map of NJ with Air Trails" (courtesy of Chris Kennedy). was on the November 1931 NYC-Albany Air Navigation Map. 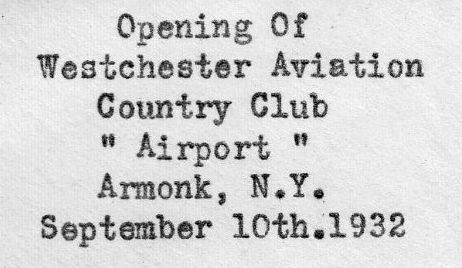 A postmark commemorating the 9/10/32 “Opening of Westchester Aviation Country Club Airport, Armonk”. A 5/20/34 photo (courtesy of Dave Finamore) of Al Williams in a Curtis Hawk at Armonk Airport. A 5/20/34 photo (courtesy of Dave Finamore) of Jacob Ruppert's Sikorsky S-39 amphibian at Armonk Airport. A 1934-36 photo (courtesy of Dave Finamore) of a Gee Bee Sportster at Armonk Airport. A 1934-36 photo (courtesy of Dave Finamore) of a visit by Capt. Eddie Rickenbacker to the Armonk Airport, with an unidentified low-wing monoplane. 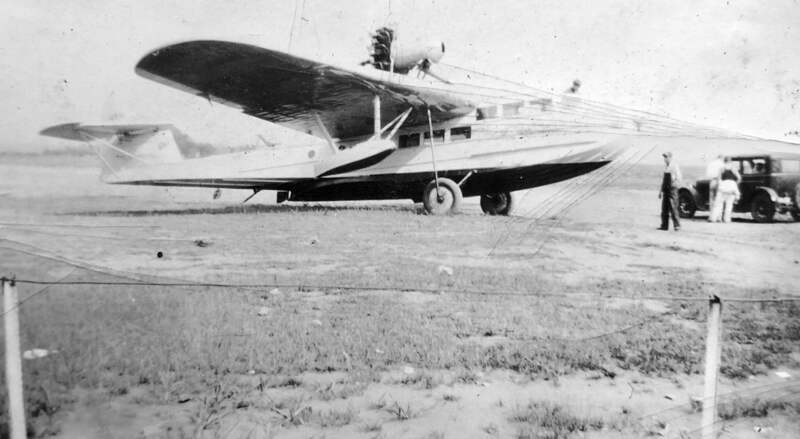 A 1934-36 photo (courtesy of Dave Finamore) of an unidentified single-engine amphibian at Armonk Airport. 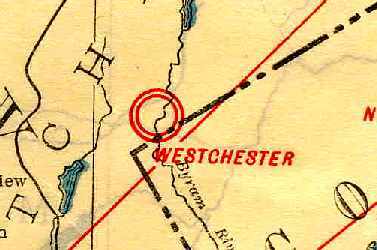 "Westchester" was depicted as a municipal or commercial airport on the 1935 Regional Aeronautical Chart. was an undated aerial view from the Airport Directory Company's 1937 Airports Directory (courtesy of Bob Rambo). with the longest being the 1,800' north/south strip. along with a hangar, one smaller building, and at least 3 light aicraft. A 1938 photo of a Goodyear blimp at Barrett Field (courtesy of the North Castle Historical Society, via Kenneth Hudson). described Armonk "Westchester" Airport as having an 1,800' unpaved runway. The 1944 directory also showed that the new "Westchester County" Airport had been constructed to the south. would eventually replace the original Westchester Airport in Armonk. 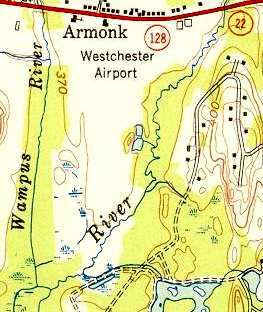 depicted “Westchester Airport, Armonk” as an irregularly-shaped grass area with a hangar on the north side. as a 66 acre irregularly-shaped property having 2 sod runways, measuring 1,800' north/south & 1,600' east/west. The field was said to have 3 hangars, the largest being a 100' x 80' stone & concrete building. Westchester Airport was described as being owned & operated by private interests. on the 1945 NY Sectional Chart (courtesy of Norman Freed). Joe Rao recalled “I soloed at Armonk on 8/3/45. The operators were Dave Finger & Bernie Chodos, all during the WWII years & I believe to about 1953. $10/hr dual instruction, $8/hr solo in J-3 Cub. I worked weekends at the outside frozen custard stand that also served hot dogs, hamburgers and drinks...got $5 a day. Hundreds of people would come out to take rides & watch the planes take off & land. mostly because of a gorgeous counter waitress for a good cup of coffee." showed 8 single-engine aircraft & 2 hangars, one of which had Westchester Airport” painted on its roof. "I had my first flight there (1950?) and it started me on a 40+ year aviation career." 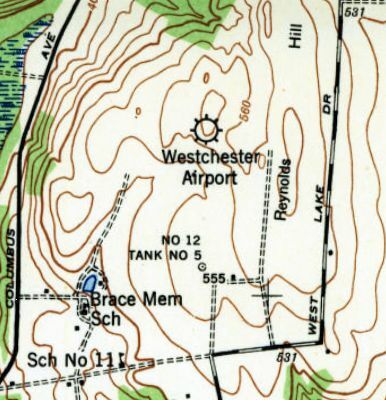 "Westchester Airport", as depicted on the 1951 USGS topo map. showing several light aircraft parked near the hangars on the airport's north side. A 1953 aerial view depicted 18 light aircraft parked on the northwest & northeast sides of the grass airfield. depicted the Westchester Airport as having 2 unpaved runways: 2,200' Runway 18/36 & 1,600' Runway 9/27. Several buildings (hangars?) were depicted along the northwest & northeast sides of the field. 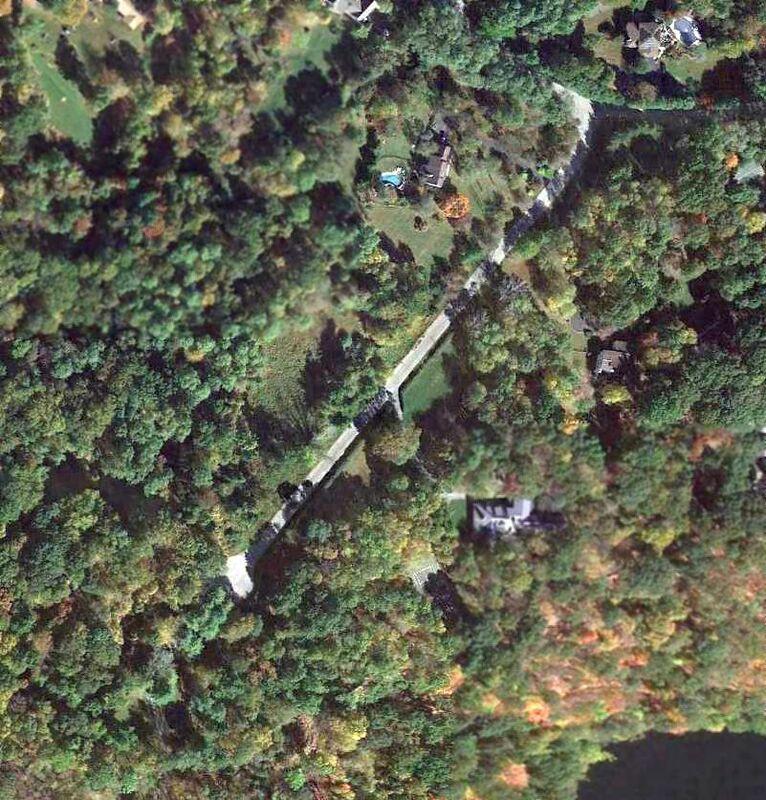 The last photo which has been located of Armonk Airport was a 1960 aerial view. with 2 hangars & a dozen light single-engine aircraft on the northeast corner of the field. as having 2 turf runways: 2,200' Runway 18/36 & 1,600' Runway 9/27. The operator was listed as Pappy's Flying Service. my parents used to take us over to Armonk Airfield to watch the planes land & take off. in an orchard immediately adjacent to the airfield”, just southeast of the airfield. and described as having a 2,200' unpaved runway. as having a 2,200' unpaved runway. as it was not depicted at all on the March 1966 NY Sectional Chart (courtesy of Mike Keefe). 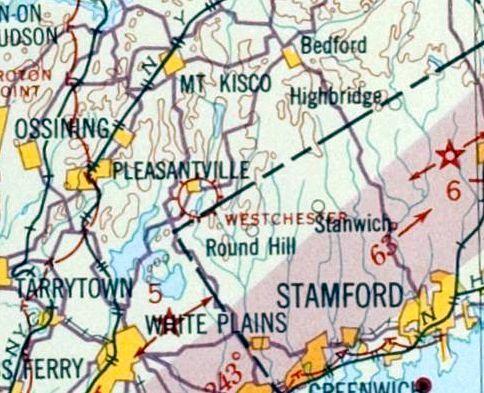 According to Joe Carey, “I-684 did not reach Armonk until 1970.
but the remains of the southern end of the runway could still be seen. The hangars had been removed. 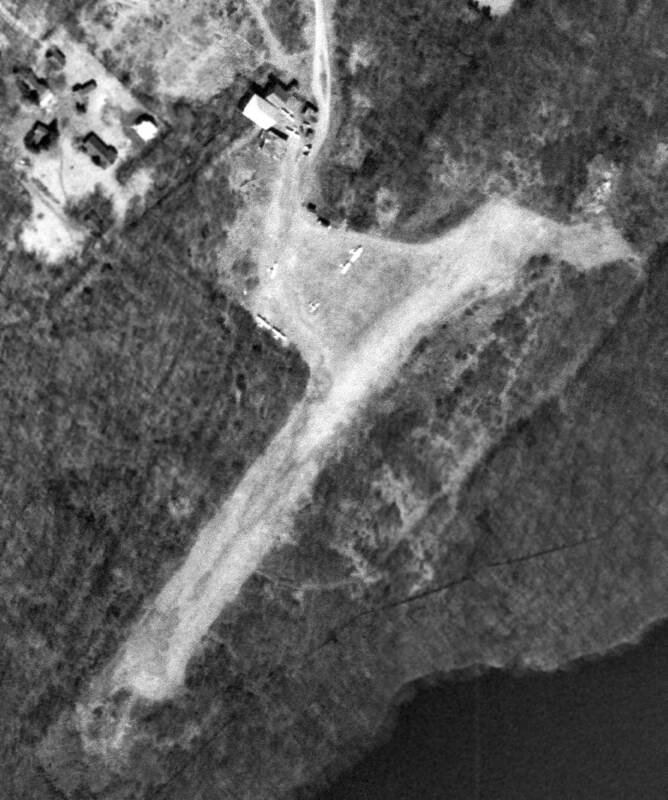 As seen in the 1993 USGS aerial view, not a trace appears to remain of Armonk Airport. According to Norman Freed, "It is now an office park & a Ramada Inn." 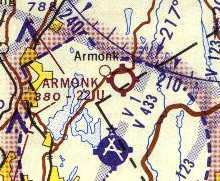 The site of Armonk Airport is located southwest of the intersection of Route 684 & Route 22.